An easy sausage pasta bake made with Italian sausages, tomatoes, red pepper flakes and garlic. Ready from start to finish in under 30 minutes, it’s so simple and perfect for weeknights. 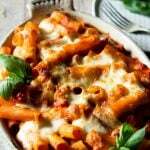 Topped with bubbling, melted mozzarella cheese it’s a comfort food favourite! Because I can’t help myself, I’m back with more cheesy pasta in the form of this spicy, creamy sausage pasta bake. I’ve been making this pasta bake for as long as I can remember and it never fails to hit the spot. It’s just so easy (cheesy) and comforting and when I need a quick weeknight dinner recipe, this is one I reach for quite often. Sometimes I’ll switch it up and leave out the mascarpone and add a splash of red wine and more spices such as fresh red chilli and fennel seeds. You could also substitute the sausages for zucchini or eggplant (aubergine) if you’re looking for a meat free version. Bring a salted pot of water to a boil and cook the pasta roughly 3 minutes under-cooked (it will then be cooked in the oven). Important: reserve 1/2 cup of pasta water for the sauce. Squeeze the sausage meat out of the skin and brown it in a pan (no need for added olive oil). Once browned add the chopped garlic, red pepper flakes and oregano (photos 1-3). Fry the garlic and spices for 1 minute then add the pureed tomatoes (passata) along with the reserved pasta water. Simmer the sauce for around 5 minutes then turn off the heat and add the mascarpone. Stir it into the tomato sauce (photos 4-6). Add the drained pasta into the sauce and mix it until completely coated. Transfer it to an ovenproof baking dish, top with mozzarella and bake until the cheese is bubbling and golden (photos 8-9). A creamy and silky tomato sauce with a kick, delicious Italian sausages bursting with flavour, rigatoni pasta and bubbling melting mozzarella cheese. 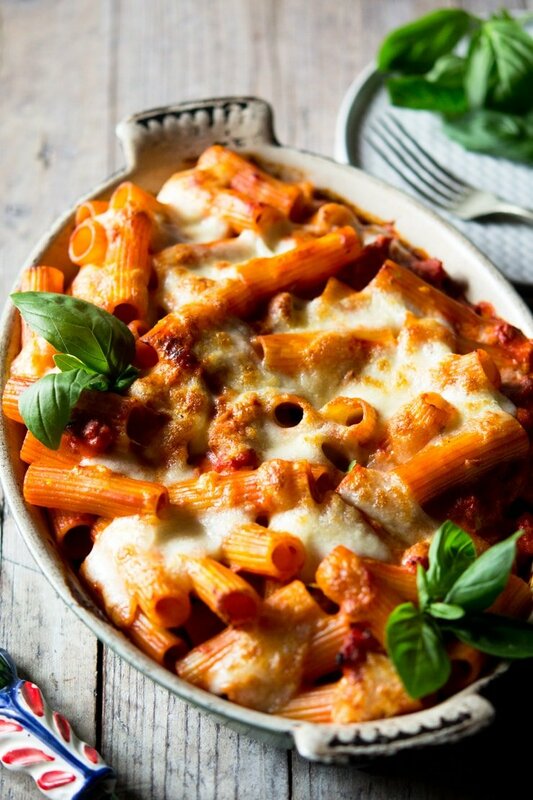 This spicy sausage pasta bake is comfort food at it’s best. Preheat the oven to 180°C/350F/gas mark 4.. Bring a pot of salted water a boil and boil the pasta around 3 minutes less than advised on the packet instructions. Reserve 1/2 cup (125ml) of pasta water. Squeeze the sausages out of their skins and brown in the pan on a medium heat. Add the finely chopped garlic, chili flakes, and oregano. Stir into the sausages and fry for 1 minute. Add the passata (pureed tomatoes) along with the reserved pasta water and a good pinch of salt and pepper, simmer for around 5 minutes. Turn the heat off and add the mascarpone, stir the sauce until the mascarpone is mixed in thoroughly. 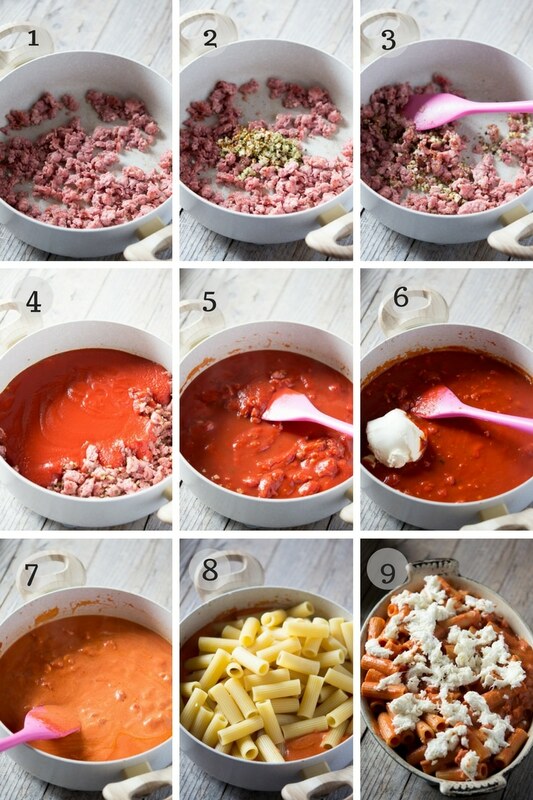 Drain the pasta and add to the sauce, mix until it's completely coated. 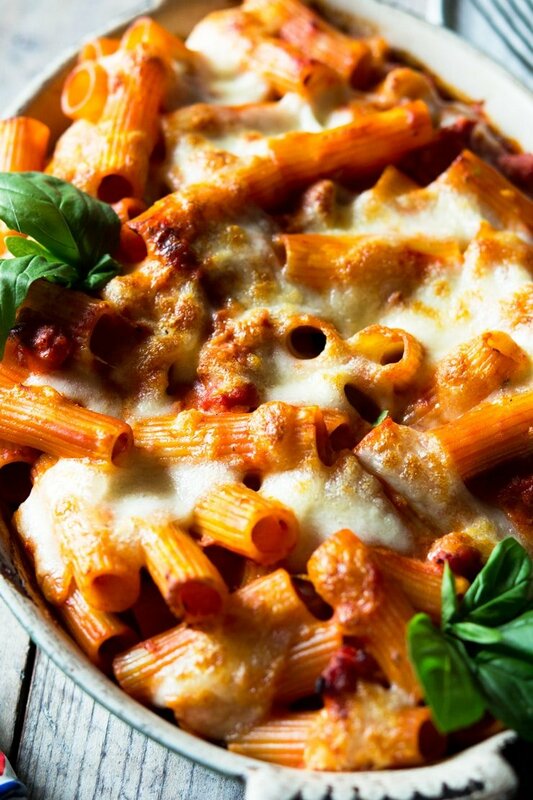 Transfer the pasta to an ovenproof baking dish and top with mozzarella. Bake in the oven for around 7-8 minutes or until the mozzarella is melted and bubbling. Serve with torn basil (optional). Try replacing the sausages with zucchini or eggplant (aubergine) for a veggie version. To make this pasta bake lighter you can leave out the mascarpone and add an extra 1/2 cup (125ml) of reserved pasta water. Try replacing the macarpone with a splash of red wine. Fresh red chilli and fennel seeds are great additions. I love pasta bakes! This recipe looks delicious with the sausage! This will be a great dinner for next week. I’m starting my menu now. Yum! This looks so easy to make! I love one pan meals because they are easy to clean up, too! And yes to all the cheese and pasta! Love pasta and this is perfect for my weekend cheat day while watching Netflix movie marathon. I think this pasta was made for a Netflix binge lol. I didn’t expect to see marscapone in this recipe to add a touch of creaminess. I love a nice, comforting pasta dish! Mascarpone is great in tomato pasta sauces, I love it! What perfectly delicious comfort food – my family would love this, we love a pasta bake. I love a little spice with my dinner. Love a good pasta bake this looks so yummy! I was having trouble concentrating after I read that you moved to Italy! My mother is from Naples, and it’s my dream to own a vacation home in Italy. Anyway, I’m intrigued by the mascarpone in this recipe! I bet it adds a nice richness. Oh wow I bet you had some amazing meals growing up!! Yes exactly it gives the pasta such a great flavour. This is lovely. My family would be excited for dinner for sure! I can’t wait to try it! Thank you so much be sure to let me know how it went! Such a perfect cold winter night splurge food. Gorgeous! how yummy! That pasta looks huge and delicious! Haha yes it is huge…I still managed to devour more than my fair share! That’s a delicious looking dish! Love Italian food. Thanks.